Disinformation takes as its starting point the idea of subverting online information and truth about ourselves through the addition and publication of incorrect facts and falsehoods. 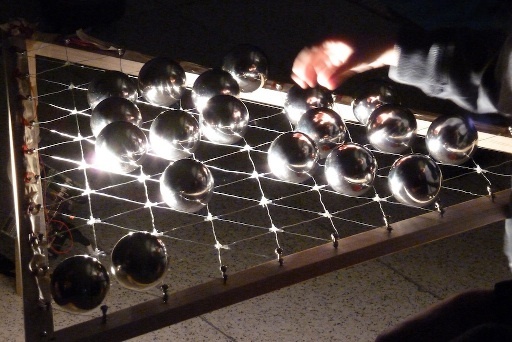 This piece supplies a compositional analogue of this idea: a default state of coherent musical sound becomes disrupted as silver balls are added to a network of criss-crossing wires. The steady tones and regular pulsations become increasingly undermined, interrupted and distorted as these disrupting 'nodes' short-circuit the wires.